Venezuelan President Hugo Chavez has questioned whether the US has developed a secret technology to give cancer to left-wing leaders in Latin America. Treated for cancer this year, Mr Chavez was speaking a day after news that Argentina's president had the disease. 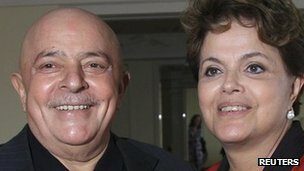 Fernando Lugo of Paraguay, Dilma Rousseff of Brazil and her predecessor Lula have also had cancer. Mr Chavez said this was "very strange" but stressed that he was thinking aloud rather than making "rash accusations". But he said the instances of cancer among Latin American leaders were "difficult to explain using the law of probabilities". "Would it be strange if they had developed the technology to induce cancer and nobody knew about it?" Mr Chavez asked in a televised speech to soldiers at an army base. Mr Chavez noted that US government scientists had infected Guatemalan prisoners with syphilis and other diseases in the 1940s, but that this had only come to light last year. And he joked that he would now take extra care of the presidents of Bolivia and Ecuador - Evo Morales and Rafael Correa - lest they also be diagnosed with cancer. The Venezuelan leader, who is 57, has often accused the US of plotting to overthrow or even kill him. He says he is now free of cancer after having surgery and chemotherapy in Cuba earlier this year. The exact details of his illness have not been made public, fuelling speculation that his condition may be worse than he has let on. Mr Chavez was the first regional leader to offer support to the Argentine President, Cristina Fernandez de Kirchner, after it was announced on Tuesday that she had thyroid cancer. "We will live and we will conquer!" he told her. Ms Fernandez, 58, is due to have an operation on 4 January, but doctors say her prognosis is very good. Doctors treating former Brazilian President Luiz Inacio Lula da Silva for throat cancer say the 66-year-old is responding well to chemotherapy and should make a full recovery. Dilma Rousseff, 64 - who took over from Lula as Brazilian president a year ago - is fully recovered after receiving treatment for lymphoma cancer in 2009. Paraguayan President Fernando Lugo, 60, was diagnosed with lymphoma in August 2010 but is now in remission after chemotherapy. Lula and Mr Chavez have previously joked that they would hold a summit of Latin American leaders who had beaten cancer. Ms Fernandez has now said that she will insist on being the "honorary president" of the summit of cancer survivors.